An exciting new feature of Knights of the Eternal Throne is the Galactic Command system which gives you the ability to impact the balance of the Force™ in the ongoing dark vs. light war. Starting from your first moments in the game, you’ll be able to choose whether to fight for the dark or light side of the Force™. If you change your allegiance, it’s no problem – changing sides can be done at any time. Plus, all of your actions, including killing enemies, completing Missions, and making choices throughout your story will determine your character’s alignment. Everything you do as part of your gameplay ultimately strengthens your impact on the dark vs. light side war by igniting explosive and unexpected dark and light side battles on your server. Let’s talk about how it all works! As one side moves closer to winning, you will see the changes reflected in the movement of the meter as one side’s color dominates the slider bar. As you can see, there are 5 “breakpoints” on each side, each representing a “level.” For example, if the light side is currently in the lead and their indicator looks like the following screenshot, then they would currently be at Light 3. Your character’s alignment directly impacts the progress of the dark vs. light battle on your server. Let’s talk about how what you do impacts which side wins the battle! As one side secures victory, the galaxy will begin to see the effects. For example, let’s say the dark side wins on your server and you are in Dark 5. Suddenly, you may begin to see dark side enemies emerging and attacking, such as a Sith Lord ready to strike against the Jedi Temple on Coruscant . Light side players can try to fend off the attack by rallying together to try to take down this new dark side threat which has emerged. Doing so may even earn them bonus command points or light side tokens to that can be used to purchase items from an exclusive light side vendor. 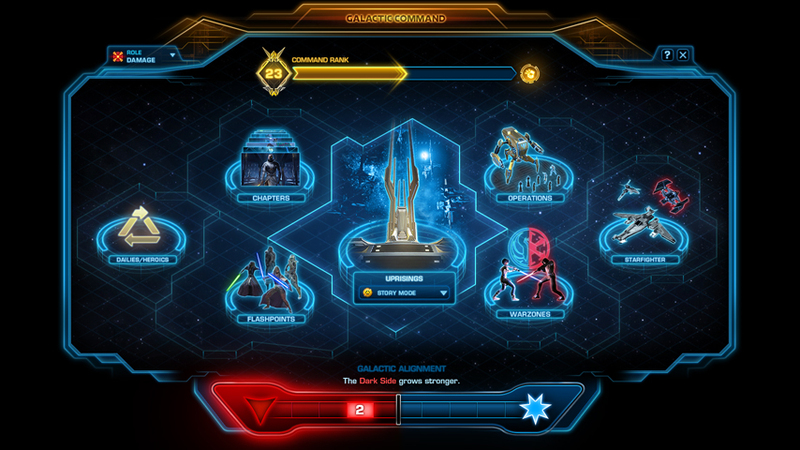 If your character’s alignment matches the alignment of the side winning on your server, you will earn a dark or light side token in addition to your normal Command Crate each time you gain a Command Rank. As an example, if your server is at Light 3 and you have a Light side character, you will earn a light side token each time you gain a Command Rank. If your character is dark side, you will only gain the normal Command Crate. So, as the dark vs. light side war is waged, your efforts will help your side to win the war on your server and you will get rewarded for your efforts! As one side earns victory, the server enters a “victory state” for a period of time and then the battle resets. It is our goal that victories will happen multiple times every day, so be sure to check-in often! During this “victory state ,” the losing side receives a short-term advantage, as all of their alignment point gains will be increased during that time ! Whether you are playing alone or you band together with friends and Guild mates to fight the dark vs. light battle, Galactic Command adds a new level of dark vs. light competition to your gameplay as you continue to fight for your side… for rewards and glory!